Although production began in December 2013, Tsui Hark (徐克) kept the casting details for his new war film Tracks in the Snowy Forest 3D <智取威虎山3D> sealed. Earlier this month, Bona Film Group released a promotional picture for the film, which revealed that Special ID <特殊身份> star Zhang Hanyu (张涵予), Bu Bu Jing Xin <步步惊心> star Lin Gengxin (林更新), and Gong <宫> star Tong Liya (佟丽娅) will be the three main leads. Tracks in the Snowy Forest 3D is a film that is based on the novel Taking Tiger Mountain By Strategy <智取威虎山>, a short novel written by Qu Bo (曲波) in the mid-20th century. 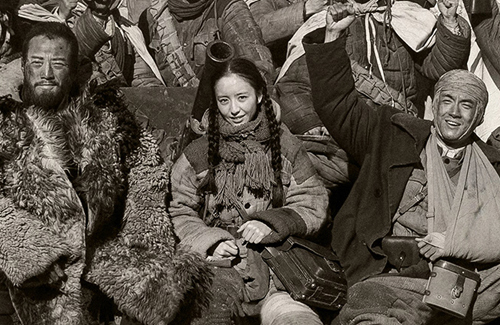 The film details the witty battles between a group of Communist soldiers and a team of bandits while fighting the snow and the cold in northeast China. The novel, which was a popular hit upon its release, was also made into a Beijing opera that was played during the Chinese Cultural Revolution in the late 1960s. Taking Tiger Mountain By Strategy is based on a true incident that happened during the Chinese Civil War in in 1946. The novel tells the story of real-life hero Yang Zirong, a Communist soldier who infiltrates a group of local bandits. His undercover experiences eventually help the Communist forces overthrow the local gangs in the territory. Qu Bo had based a character in the novel on himself, and another character on his lifetime partner, Liu Bo (劉波). Ninety-year-old Liu Bo also visited Tsui Hark on the set of Tracks in the Snowy Forest and expressed that she is looking forward to the film. Lin Gengxin is portraying Little Jian Bo – the role Qu Bo based himself on – and Tong Liya portrays Bai Ru, which is based on Liu Bo. According to executive producer Yu Dong (于冬), CEO of Bona Film Group, Zhang Hanyu recommended himself to portray the role of Yang Zirong. Yu Dong remarked that he has never seen an actor so devoted and desperate for a role, stating that Zhang Hanyu was “begging on his knees”. With such passion, Yu Dong said it was impossible to reject him after a three-year discussion. I am rooting for the bandits on this one. What the heck got into Tsui Hark? Didn’t his family fled Vietnam after the fall of Saigon? Do you root for the Japanese in the WW2 Chinese films? Maybe will watch since it is based on true story. It’s too bad his camera work has gotten so predictable because now I can’t watch his films which probably have some good messages. I remember really liking Peking Opera Blues even though it has awkward moments. I seriously hope this is a one off. It seems like all the mainland produce is communist war crap serial dramas. I am shocked that this story hasn’t already been told a thousand times in other tv series/movies. – Oh Wait, it has, only change the plot slightly. There are only so many ways you can produce this propaganda without it looking exactly like the last one that came out the day before. I predict this movie won’t come close to making as much as his earlier/better stuff and gets lost in the mountain of other propaganda films. Way to tank your movie before it’s even released. I will never understand why experts in a field will branch out to copy the masses when there is such a demand for their expertly crafted products/Movies/Music/etc etc. Innovate in your field of expertise, don’t try and copy what everyone else is doing just to please your overlords or accountants. Funny thing is, I would have loved to watch this had it been set in ancient times with the same storyline (love those types of ancient strategy movies), but not going near it now that its just another pro-communist propaganda piece. It’s a shame, I think he could do a really great ancient army/seige type movie. I loved the set pieces and naval battles in Sea Dragon. I’m happy for Lin Gengxin after the not so nice treatment he’s got from Tangren. Me too and am glad that he is doing pretty well even without them. i will try to watch b/c of lin gengxin and tong liya.